The prophetic clock is ticking. Lucifer and his army of “imps” search frantically for the prophetic “seed of the woman,” prophesied by God to rise up and crush the serpent’s head. Book 2 of The Chronicles of the Host Biblical fantasy series by D. Brian Shafer. The prophetic clock is ticking. Lucifer and his army of “imps” search frantically for the prophetic “Seed of the woman.” The memory of God’s promise that this seed would rise up and crush the serpent’s head stirs them to shadowy demonic activity. 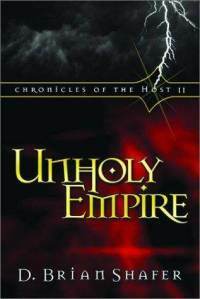 Unholy Empire chronicles the duel between God and the fallen angels as both focus their attention on the Seed. The devils watch for any and every sign of the Seed in an all out effort to stop, delay, compromise, or otherwise destroy this impending prophetic nightmare. If they fail they are all doomed. Book 2 of The Chronicles of the Host series, Biblical fantasy for adult readers.